Alexandria also known as the Pearl of the Mediterranean is picturesque and is also the second largest city of Egypt. Get your Alexandria flight booked and visit the mesmerizing beaches, museums, historic sites, and much more. Rehlat offers exclusive discounts and last minute deals on Alexandria flight ticket booking. Book for round trip Alexandria flight ticket and save more than one way trip. 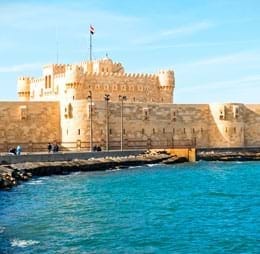 Alexandria has many notable spots like the Citadel of Qaitbey, Alexandria National Museum; Pompeii Pillar and the New Library of Alexandria which is also home to world class art galleries and an amazing planetarium. The Egypt city also boasts of breathtaking attractions such as Bibliotheca Alexandrina, Alexandria National Museum, Ottoman Houses, Fort of Qaitbey, Kom al-Dikka, Pharos Lighthouse of Alexandria, Coptic Orthodox Partiarchate and Unknown Soldier Square. Alexandria is a must visit for people looking for traditional clothing and souvenirs. The city consists of wide range of shopping malls across the city such as Carrefour City Center, Deeb Mall, Green Plaza Mall, City Light, Zahran City Mall, and San Stefano Mall. The city has many cafés and restaurants such as Stefano's, Byblos, Kala, Samakmak, Four Seasons Hotel, Fresca Cafe and Gelateria, Spectra Restaurant & Cafe, Lebanero and Minouche Pizza. Guests can experience taste of Egyptian delicious dishes in restaurants such as Baba Ghannoug, Dakka, Kebab, Kofta, Keshk, Dolma, Moussaka, Molokheyyah, Shawarma, Tahini salad, Bram rice and Shakshouka. There are many trains, buses and taxis to wander around the city. Ground floor: Check in and luggage handling procedures will be organized. Second floor: Domestic and international passenger arrivals including administrative offices and airlines offices will be organized in the second floor. Third floor: This floor is allocated for passenger departures, both domestic and international, immigration procedures and a VIP hall. Guests can find several buses and taxis to arrive at Alexandria airport from the city. You have entered the same arrival and departure city. Please reconfirm your entry and try again.